Wisconsin Rivers Shown on the Map: Apple River, Baraboo River, Black River, Chippewa River, Eau Claire River, Flambeau River, Fox River, Jump River, Kickapoo River, Menominee River, Milwaukee River, Namekagon River, Peshtigo River, Red Cedar River, Rock River, St. Croix River, Wisconsin River, Wolf River and Yellow River. Wisconsin Lakes Shown on the Map: Beaverdam Lake, Castle Rock Lake, Lake Chippewa, Lake Du Bay, Lake Koshkonong, Lake Mendota, Lake Poygan, Lake Winnebago, Petenwell Lake, Turtle Flambeau Flowage and Willow Reservoir. The topography of an area determines the direction of stream flow and often is a primary influence on the geographic distribution of precipitation. 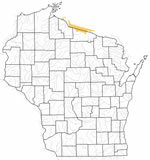 View a detailed Wisconsin elevation map. 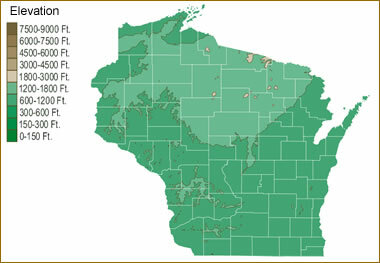 The United States Geological Survey has a number of stream gages located throughout Wisconsin. These estimate stream levels, discharges and record them over time. This data is published on the web and many stations allow users to plot custom graphs. Get updated Wisconsin river and stream levels from USGS here. The United States Geological Survey has a system that will send you an email message when flood levels are reached on any steam with USGS gaging equipment that you have selected. Sign up here to recieve Wisconsin stream and river level alerts. 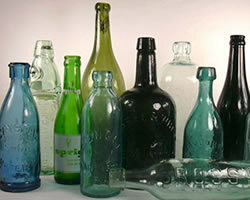 The United States Geological Survey has a number of publications related to water use and water resources in Wisconsin. 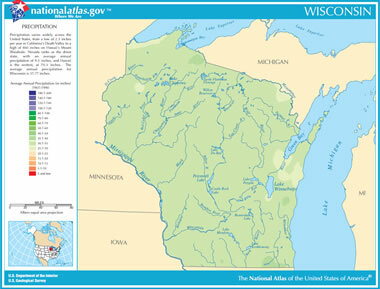 View the water resource publications for Wisconsin here. 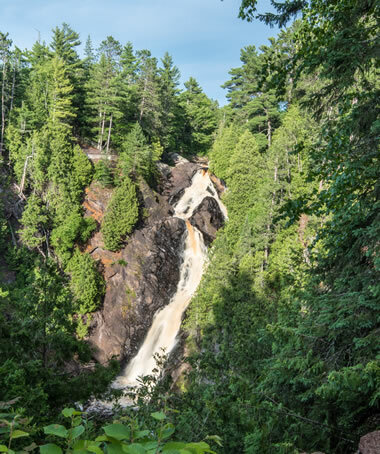 Big Manitou Falls is the tallest waterfall in Wisconsin, with a height of 165 feet. It is located on the Black River in Pattison State Park. The river has an orange-brown tint due to minerals in the water. Image copyright by iStockphoto / rruntsch. The United States Geological Survey publishes updated drought maps on their website. There you can view a map that shows where below normal 7-day average stream flow conditions were recently recorded. The maps are updated daily. Get a current Wisconsin drought map here. The National Atlas Project has precipitation maps for Wisconsin and other states that you can view online or print for personal use. These maps show the average annual precipitation levels mapped across the state. View and print an Wisconsin precipitation map here. Precipitation maps prepared by the PRISM Climate Group at Oregon State University and the United States Geological Survey.